The Organic Consumers Association (OCA) today issued this statement in response to today’s verdict in the case of Dewayne Johnson vs. Monsanto Co., awarding $289.2 million in damages to plaintiff Dwayne Johnson, a former school groundskeeper who, after being required to spray Monsanto’s Roundup herbicide, is terminally ill with non-Hodgkin lymphoma. 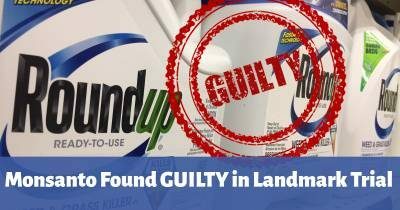 “This verdict proves that when ordinary citizens, in this case a jury of 12, hear the facts about Monsanto’s products, and the lengths to which this company has gone to buy off scientists, deceive the public and influence government regulatory agencies, there is no confusion,” said Ronnie Cummins, OCA’s international director. “This is a company that has always put profits ahead of public safety, and today, Monsanto has finally been held accountable. Featured image is from OCA.